We booked our package from "Dial-o-Flight" group, and started with the flight from Delhi to Bangkok. 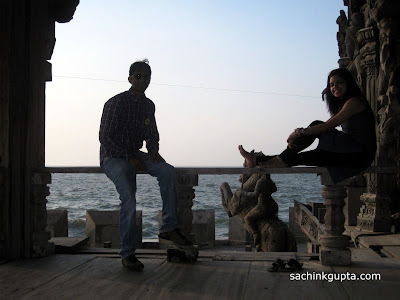 Being with Meenal, the clocks were running so fast and We reached Bangkok in no-time. :) We took on-arrival Visa (1000 Bahts each), and struggle for some good veg snacks at the airport, and found some at Starbucks Coffee. 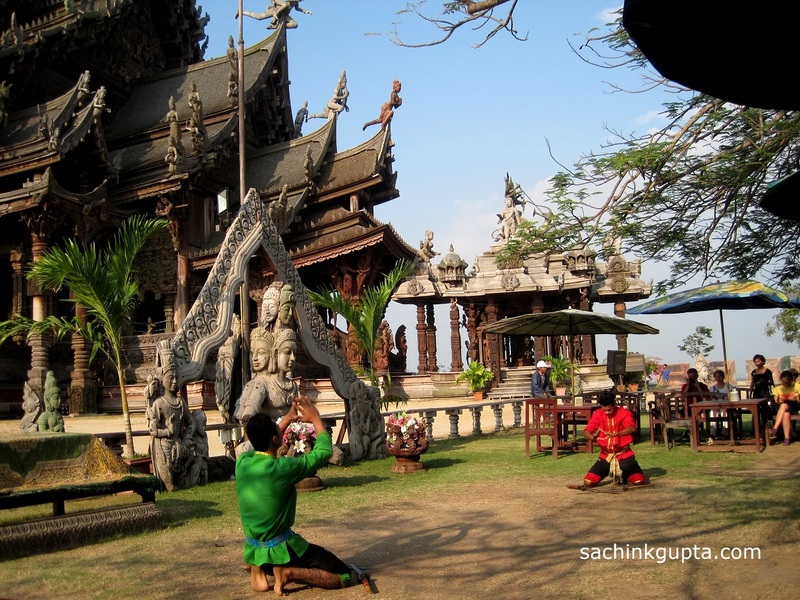 After that as per our tour package we transferred to Pattaya in a sleepy fashion. I have done a bit of search to cover important places as per our schedule, and it really helped a-lot. For the first day at Pattaya, we booked "The Sanctuary of Truth", "Mini Siam", and "Tiffany Show", and started with the first one. 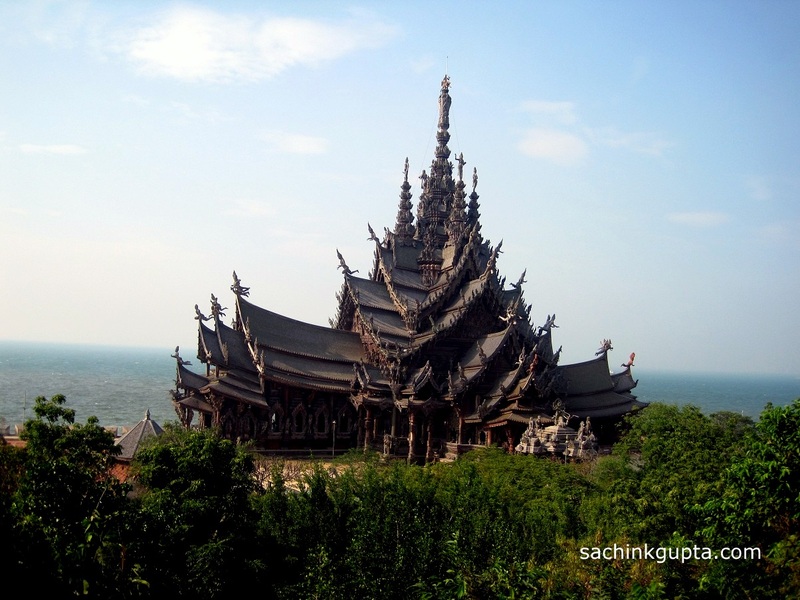 On The Seashore of Rachvate Cape, Pattaya, lies a construction called "The Sanctuary of Truth". Open Time: 8:00 a.m. Close Time: 5:00 p.m.
From the ground breaking in 1981. The objective was to build a wooden structure, in order to preserve and revive Ancient Knowledge. It has a all-wooden structure of more than one hundred meters high (equal to twenty story) modern building. The truth that was shown through the Sanctuary is the relationship between human beings and the universe, which are the father, the mother, the earth, the sky, the sun, the moon and the stars. It has searched for the proper things from different cultures, and mixed with traditions of past, giving rise to the new fine arts. To be amazed as friendly mystical creatures, Take elephant ride, ride of lifetime atop chariots of the angels, speedboat ride just back of the sanctuary so that you'll live life's truly unforgettable magical moments. The project was initiated as an idea of Thai businessman Lek Viriyaphant in 1981, and is expected to be complete in 2025. We entered just in time, the second show (cultural dance) was about to start, and it was good to watch, and capture some loving moments with friendly people. I have linked many photos of front view, interior view, back view in the above album. We had a enjoyable walk all around "The Sanctuary of Truth" hands in hands. Being with Meenal, make these times more enjoyable and memorable. After that we proceeded for our next destinations of the day "Mini Siam", and "Tiffany Show". Another must visit place in Pattaya, with undersea activities "Coral Island Pattaya Tour". A day enjoyed in Bangkok, with Chao Phraya Cruise "Bangkok City Tour"
The Group snap is amazing. Good article written. I decided to do my certification while on vacation in Thailand and Super Divers came highly recommended, and rightfully so. I did an open water certification over three days and had a fantastic time www.privatetoursinistanbul.com and was fantastic. Everything was arranged seamlessly, from the completion of the tests both written and in the pool at first, to the dives. They arranged everything including pick ups and drop offs, equipment, etc. I am usually an extremely difficult customer, but I was more than satisfied with the service i received. The right balance of professionalism and a relaxed attitude was present at all times. Amazing! I think these people are really so talented, i would love to see how they make it. Hey man.u visit really nice place in Pattaya. people usually miss this place. This is nearby my place. Thank you so so much for this post!! I googled the Santuary of Truth in Pattaya and it was a spur of the moment decision, taken despite poor reviews by many local tourist agents. This was the best part of my entire trip to Thailand. Good to see you like the place and post. We also taken this tour to SOT out of our package. It was wonderful time for us. Post seems quite good with good photos. Have u taken any souvenirs from there. Yes, this place was on my list before going there. 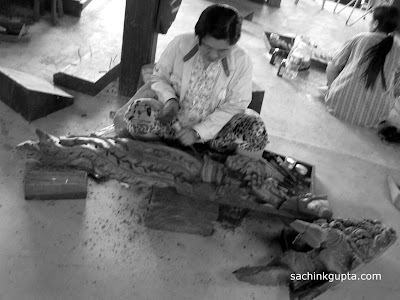 We also took few wood souvenirs, and photograph with the performing group. Really thanks a ton.!!!! great info about SOT.Thanks for sharing.